You don't have to look hard to spot the 42DA8BJ's main claim to fame. 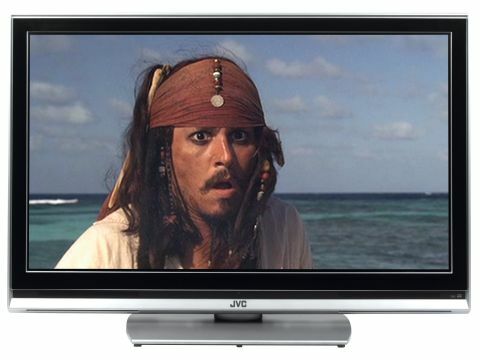 It's a 42in LCD TV that costs just £1,000. But is it really as great value as it appears? It's nothing special to look at, certainly. The combination of a glossy black screen frame and plasticky outer silver edge feels a bit untidy, somehow. There are a couple of connection shortcomings too, as we failed to turn up either a four-pin S-video input or, more worryingly, a D-Sub PC connection. Apparently you can show a PC picture if you use one of two HDMI sockets and set your PC's resolution to match the screen's 1366 x 768 pixel count, but this is hardly ideal. Still more disappointment comes from the discovery that there's no 1080p support from the HDMIs. But before we start getting too miserable, let's recall that £1,000 price tag. The sort of 'problems' we've been describing will all be relatively easy to swallow if the set's performance turns out OK.
Hopes that the performance will indeed be OK are raised by the inclusion of JVC's DynaPix image processing system. With its talent for boosting detailing, rescaling standard definition images cleanly, improving black levels, and automatically managing contrast and colour, it has delivered some notable hits in the past. Sadly, not even DynaPix's best efforts can save the 42DA8BJ from mediocrity. For instance, watching Barbossa and Jack fight in the dark treasure cave on our Pirates of the Caribbean: The Curse of the Black Pearl Blu-ray disc isn't as enjoyable an experience as it should be, thanks to a low-contrast grey pall that hangs over the dark parts of the picture, denying the scene a sense of scale and obscuring background details. Another slight problem during this scene is motion blur, with the swishing swords and camera pans both looking slightly unclear - especially in comparison with the plasma contenders in this group test. Also suspect is the colouring of the two captains' faces, with their skintones looking slightly unhealthy. For all these problems, though, the 42DA8BJ isn't without its redeeming features. Bright scenes like the one where Jack and Elizabeth are marooned on a desert island look great; full of vigorous, fully saturated colours, extremely detailed, and impressively free from most noise types. The set also does unusually well with bright standard definition sources, as DynaPix makes them look much sharper without introducing loads of attendant processing noise. Its audio is also more than acceptable for such a cut-price TV. We ultimately have no choice but to conclude - given that the 42DA8BJ is outperformed by all of its rivals today - that the 42DA8BJ's £1,000 price is less attractive than we'd initially hoped.